Robert Alexis Traiteur’s story is one of a passionate young man who, after lengthy—perhaps exceedingly lengthy—university studies, decided to focus on what he loved most: entertaining. On October 6, 1980, Robert Arslanian set out on his first adventure in the restaurant business with L’Entre Miche, a friendly, 35-seat bistro. Conveniently located on Sainte-Catherine facing Télé-Québec, L’Entre Miche only served breakfast and lunch. As risky as this may seem, the restaurant was a resounding success in record time. Always packed, it received high praise from the likes of Françoise Kayler, Gildas Meneu, Debeur, Josée Lapointe and Jean-Yves Girard, to name but a few. Just one week after the restaurant opened, Télé-Québec put in its first lunch order. Over time, with all the orders and receptions it was handling, L’Entre Miche was beginning to look like a caterer. The restaurant decided to embrace its new vocation, organizing its first Christmas party the year it opened—with 350 guests! In the early 80s, Montréal gastronomy was still in its infancy. Smoked salmon, foie gras, crab and Middle Eastern spices were still just curiosities at the time. With all these original ingredients, a whole new world was opening up. Three years after L’Entre Miche opened, Robert, tired of repeating, “Sorry, we’re fully booked,” decided to invest in an adjacent space that could seat 55 patrons. In the gleaming kitchen beneath the bistro, the catering service really took off. What’s more, each week, L’Entre Miche delighted the guests on Parler pour parler with Janette Bertrand. Needless to say, it was a terrific showcase. Alexis, Robert’s son, was born in 1987. The young family lived above the bistro at the time, and on the day little Alexis came home from the hospital, Louise Deschâtelets and Janette Bertrand happened to be there to play welcoming committee. “They were at the bistro for the show Les carnets de Louise, enjoying my pastries when Alexis arrived,” jokes Robert. The little one’s future, it seems, was already mapped out. One year later, the new space was already too small, so Robert bought the adjacent building and expanded the catering service’s kitchen. It was an ambitious project, even for an experienced restaurateur. One year later, the new space was already too small. Robert decided to buy the adjacent building and expand the catering service’s kitchen, but it would turn out to be a short-term solution. Soon after, L’Entre Miche had to double and even triple its surface area to be able to serve the two tonnes (!) of beef bavette its patrons were demanding every year. At the same time, the catering service was entering the big leagues. In 1992, the year of Montréal’s 350th anniversary, Robert won the contract for the inauguration of the Pointe-à-Callière museum by proposing a historic, New France-inspired menu. He concocted his own hippocras for the occasion, a sweet and spiced wine that was popular among settlers, and bottled Saint-Pierre spring water, named for the little river that once flowed north of the Pointe. The event was a resounding success, instantly establishing the reputation of L’Entre Miche’s catering service. After that, the phone rang off the hook, and a succession of exciting proposals followed. Robert had ample opportunity to explore his creativity and perfect his art, on the famed Le Maxime, for example, where the team worked the boat to the rhythm of the lambada all summer long (it was the 90s, after all), or at Guy Laliberté’s legendary Grand Prix party. But if he had to choose one event that catapulted him to the top, it would likely be the 1997 Canadian Open at the Royal Montreal Golf Club, the oldest private golf club in North America. Once again, it was an ambitious project, even for an experienced caterer, but Robert was up for the challenge. In just four days, 20,000 meals were served under the tents! Exhilarated by the event’s success (not to mention Tiger Woods’ autograph on his apron), Robert refused to rest on his laurels. He formed a partnership with Jean-François Plante (Bistro L’Aromate) and opened Café Rock Détente, where brunch was hosted by a chansonnier; he also let his grandiose aspirations get the better of him with Robert et Compagnie, a three-storey restaurant featuring a waterfall and mature trees! Today, Robert is grateful to his amazing team, without whom none of these tremendous accomplishments would have been possible. From the kitchen to the reception hall, the level of quality that has earned Robert Alexis Traiteur its stellar reputation is the result of each team member’s passion, know-how and dedication. In the summer of 2000, Robert was already preparing for the Du Maurier Open that was to take place in September at the prestigious Royal Ottawa Golf Club in Aylmer. He spent the whole sunny season searching for and selecting suppliers, designing the menu and managing logistics. The entire team would be staying under the same roof! 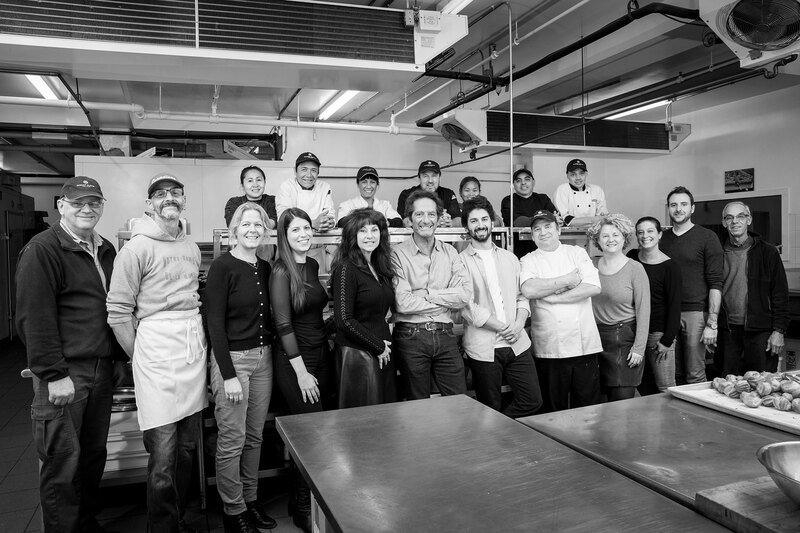 That was a tour de force in itself, but the most memorable part of this massive undertaking was that 10,000 meals were served in four days, under the watchful eye of the incomparable Chef Philippe Buelens. The team outdid itself yet again, this time with the help of a 13-year-old Alexis who, at the wheel of his electric cart, was supplying the tents with beverages. Robert barely had a moment to catch his breath. In August 2001, he acquired Pâtisserie Gaumond and its catering service, Images et Saveurs. He’d come a long way since the 35-seat space in front of Télé-Québec. Robert was now at the helm of a large organization, as well as a factory that ran non-stop 18 hours a day to supply shops and supermarket displays with cakes, pastries, chocolates, charcuterie, frozen dishes and vacuum-sealed meals. With Pâtisserie Gaumond’s operations, his booming catering business and his three restaurants, Robert was firing on all cylinders, but the time had come to make compromises. With a heavy heart, he sold his bistro, L’Entre Miche, as well as Café Rock Détente. Four years later and a tad tired, he parted with the rest, except for Robert Alexis Traiteur and the facilities on Wellington street. He still needed somewhere to work! Even though he reduced the scope of his business, he still dreamed big. From 2008 to 2011, he delighted the crowds at the Uniprix stadium (now the Stade IGA) as the official caterer of the Rogers Cup. Food counters, VIP lounge, restaurants under the tents… From lobster risotto hot dogs to gourmet fries, Robert Alexis changed the game and put on a show. As always, Chef Philippe Buelens and his team met the challenge brilliantly.